MOSCOW, October 30 (KATAKAMI / Itar-Tass) — Russian Prime Minister Vladimir Putin has visited Airborne Troops Commander Vladimir Shamanov in the Burdenko central military hospital. Shamanov was seriously injured in a road accident on Saturday morning. 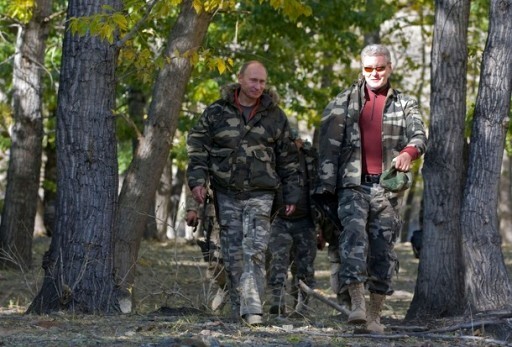 Specialists are highly skilled here, and so everything will be good, Putin assured. “The spirits are high, and it is the main thing,” he added. The premier noted he would not speak at the time about what happened, adding that the main thing was how Shamanov felt. Speaking to the doctors and hospital executives, Putin noted that serious work was to be done for the general to regain his health. 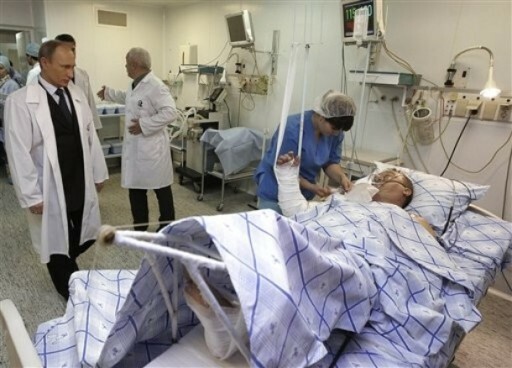 The doctors told the prime minister that Shamanov would undergo an operation next week. Fifty-three-year-old Shamanov got into the accident in the Tula Region on Saturday morning. The BMW car in which he was collided with a MAZ vehicle. Shamanov was taken to the Burdenko hospital at 19:02 Moscow time. He has an arm trauma, a shin fracture and brain concussion. 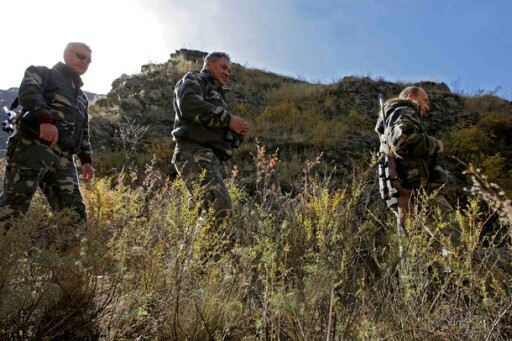 Russia's Prime Minister Vladimir Putin (R), Emergencies Minister Sergei Shoigu (C) and former Government Chief of Staff and newly-appointed Moscow Mayor Sergei Sobyanin take part in an expedition to Ubsunur Hollow Biosphere Preserve to inspect the snow leopard's habitat in Tyva Republic in the Siberian Federal District in this undated photo. October 15, 2010 (KATAKAMI / RIA NOVOSTI) — Russia will soon supply another shipment of tanks to Venezuela, Prime Minister Vladimir Putin said at a meeting with Venezuelan President Hugo Chavez on Friday. “Thirty-five tanks will be delivered soon,” he said. Chavez said the two states would speed up military cooperation. Venezuela is building a plant to manufacture Kalashnikov assault rifles. Since 2005, Venezuela has bought over $4 billion worth of Russian weapons, including warplanes, helicopters, and Kalashnikov assault rifles. Earlier on Friday, Russia and Venezuela signed an agreement on the construction of a nuclear power station in the South American state. The agreement was reached in April 2010 during Putin’s visit to Caracas. The presidents of Russia and Venezuela, Dmitry Medvedev and Chavez, said on Friday bilateral ties are strengthening. Medvedev also said Venezuela acted “like a real friend” when it followed Russia in recognizing the former Georgian republics of South Ossetia and Abkhazia after Chavez’s last visit to Russia in September 2009. 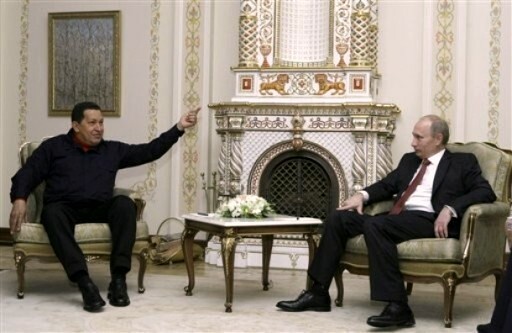 Chavez arrived in Moscow on Thursday as part of an international tour that also includes Belarus, Ukraine and Iran. (KATAKAMI / RIA NOVOSTI) — Russia’s Prime Minister Vladimir Putin took part in the opening ceremony of the Russian section in the Russia-China oil pipeline, which took place in Russia’s Far Eastern Amur region on Sunday. At the beginning of the opening ceremony Putin called the pipeline a multidimensional project to step up Moscow-Beijing energy cooperation. “This is vital project for us as we diversify the deliveries of our strategic raw materials. Thus far, we made the major deliveries to Europe…The Asia-Pacific region received unsubstantial volumes,” Putin said. “The implementation of this project is a crucial task for Russia and our Chinese friends. It means stabilization of supplies and energy balance for China, and for us it creates entry to new challenging markets, in this particular case, to the growing market of China,” Putin said at the ceremony. The project is part of the East Siberia – Pacific oil pipeline, which was launched into operation in December 2009 and is designed to pump up to 1.6 million barrels (220,000 tons) of crude per day from Siberia to the Far East and then on to China and the Asia-Pacific region. The Russia-China pipeline will stretch from the town of Skovorodino in the Amur region to the city of Daqing in China’s northeastern Heilongjiang province. “I recall how Chinese President Hu Jintao broached the issue of the project’s implementation in time of one of his visits to Moscow. We were then discussing the rout of the project, were the pipeline would lie: to the north or to the south of the Lake Baikal,” Putin said at the opening ceremony. He emphasized that both Russia and China have known that the issues are complicated but all of them would be successfully resolved. “I hope, our Chinese friends will tell the Chinese president and the prime minister about the fact… that the project has been accomplished in Russia. But Chinese friends will have to work for a while. Major efforts are ahead for them – 930 kilometers [of the pipeline] should be put up, these are high-technology operations,” Putin said. “But I am absolutely confident that Russian oil will enter China this year,” he added. In March, Chinese Foreign Minister Yang Jiechi said the construction of the pipeline would be finished by the end of the year and become fully operational in 2011. Russia’s largest oil company Rosneft, oil pipeline monopoly Transneft and China’s state-owned China National Petroleum Corporation (CNPC) are partners in the project. In line with the contract, the Chinese side provided the Russian companies with a $25-billion loan to construct the pipeline. In exchange, the Russian side agreed to pump 15 million tons of oil per year via the pipeline in 2011-2030. (KATAKAMI / RIA NOVOSTI) — Prime Minister Vladimir Putin underlined on Saturday the significance of a planned new space center in Russia’s Far East. “We began talking about the necessity of building such a space center in 2005,” Putin, speaking at the Amur Region site where the Vostochny Space Center is to be built, said. Russia currently uses two launch sites: the Baikonur space center in the Central Asian Republic of Kazakhstan, which it has leased since the collapse of the Soviet Union, and the Plesetsk space center in northwest Russia. He also said that cargoes and satellites would be launched from the space center from 2015. The new space center, which will employ 20,000-25,000 people, will ensure Russia’s independence in the launch of piloted space vehicles, currently carried out at Baikonur. Construction is expected to start in 2011, with design and survey work already under way. Putin said in July that Russia would allocate 24.7 billion rubles (around $811,000) for the next three years for the construction of the space center. (KATAKAMI / RIA NOVOSTI) — Russia’s car industry had a pleasant surprise for Vladimir Putin on Friday as the prime minister was moved to praise the Lada Kalina he is driving through four Far Eastern Russian regions. Stopping to fill up the tank at a gas station almost 400 kilometers into his 2,000-kilometer trip along the newly-completed highway from Khabarovsk to Chita, Putin praised his Lada Kalina to a group of tourists. “Unexpectedly, it turned out to be a very convenient, comfortable and reliable car,” Putin said when asked why he had chosen the latest offering from Russia’s car giant AvtoVAZ, which started selling the model in 2005. “Try buying this car. I assure you, you won’t regret it,” he said. He added that he would have been happy driving any AvtoVAZ car. While western experts say the outlook for Russia’s indigenous car industry is grim, with some arguing the Russians only buy domestic cars because they cannot afford foreign marques, the Kremlin continues to put on a brave face. Billions of rubles have been earmarked to help struggling automakers, and AvtoVAZ has been the main beneficiary of the country’s cash for clunkers scheme, which gives people trading in old cars 50,000 rubles towards the purchase of a Russian-made car. These days, Russian-made vehicles include thousands assembled from imported knocked-down kits by Renault, Ford, Daewoo and many other international carmakers. Despite the low price tags, many Russians remain wary of the Ladas and Volgas that have in various forms rolled off production lines for over 30 years now. Even the country’s bureaucrats have resisted the allure of a domestic set of wheels – several feeble attempts to force them into Ladas and Volgas over the past decade have not gone beyond high-flown patriotic words in the parliament. Instead, the elite have grown even more attached to their jet-black Mercedes and BMWs. (KATAKAMI / RIA NOVOSTI) Russian Prime Minister Vladimir Putin has recently written an introduction to the book about the late Russian President Boris Yeltsin, saying he could not criticize the person who determined his future. The Yeltsin’s biography, written by Boris Minayev, was published on the eve of the anniversary of Russia’s August coup d’etat in 1991 that resulted in ousting President of the Soviet Union Mikhail Gorbachev and proclaiming Yeltsin the new president of Russia. Russian social political weekly Ogonyok published on Monday the introduction written by Putin, who succeeded Yeltsin on the highest state position in 2000. “I said several times that when Yeltsin’s presidency was coming to an end, that I saw a different destiny for myself. But everything turned out differently. And this was the choice of my life,” Putin wrote. The premier said he personally could not criticize Yeltsin either. “These exact words should remain in history, to become the main parting words for everybody who takes this high position,” Putin said. (KATAKAMI / RIA NOVOSTI) Russian Prime Minister Vladimir Putin on Friday arrived in the wildfire ravaged region of Nizhny Novogorod, where more than 500 homes have been destroyed, to assess the situation. Over the last 24 hours, 505 homes have been destroyed in the largest wildfire in the European part of Russia. Russia’s Emergencies Ministry has not received reports of human casualties from the Nizhny Novgorod region, but at least 1,662 residents have been evacuated from the areas threatened by quickly spreading fires. (KATAKAMI/ VOA) ) Russian Prime Minister Vladimir Putin and Ukrainian President Vyktor Yanukovych held talks on a wide-range of issues Saturday in Ukraine. The meeting took place at Mr. Yanukovych’s vacation home in the town of Foros on Ukraine’s Crimea peninsula. Russian media reports say the talks focused on trade issues. Prior to the meeting, Mr. Putin participated in a motorcycle rally near the port city of Sevastopol on the Black Sea coast of the Crimea peninsula. 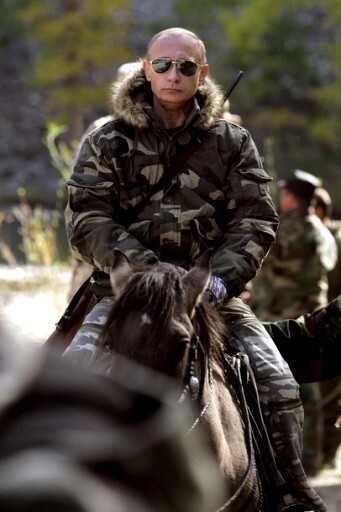 Mr. Putin roared to the rally on a Harley Davidson mortorcyle where he addressed thousands of motorcycle enthusiasts. Mr. Putin’s visit to the Crimea coincides with Russia’s Navy Day, which is observed Sunday. Sevastopol is home to Ukrainian naval forces and to Russia’s Black Sea fleet. Speaking on Saturday Mr. Putin said it was symbolic of the friendship between Russia and Ukraine that both Russian and Ukrainian seamen will celebrate the Russian holiday. The Russian base at Sevastopol was a major issue of contention between Russia and Ukraine after the break up of the Soviet Union.